Yep, we’re taking a little detour on our way to Detroit. Since we’ll now be so much further away from our (my) Hawaii family, we wanted to make sure to visit one more time before the big move. We will be hopping on a plane at the crack of dawn tomorrow morning. Setting my alarm for 5:15am. Ouch. The weather forecast is rain, rain, rain. Hopefully the sun will appear long enough to give us some time at the beach. I’d like to get a couple posts done while I’m there. If not, I’ll definitely have a bunch of material to share when I return next week! 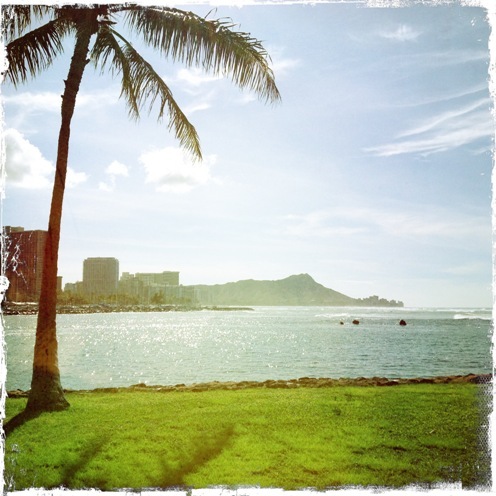 This entry was posted in Hawaii, Places and tagged Honolulu. Bookmark the permalink. Hope you’re enjoying your stay! Travel safe! It hasn’t been raining as much as anticipated (at least not on Big Island). Hopefully you’ll catch some luck! Thanks! We did luck out and really only ran into a couple sprinkles once while driving. Yay. Wow, your heading for a big switch in the weather! Winter is a tough time to move north. Have fun on the island! Thank you! We’re moving in the Spring – a perfect time, I think.